In casino´s, 21 is the aim when playing Blackjack. The Impel Trading Card #21 however, is showing Dusty. Air Conditioning Repair Man. 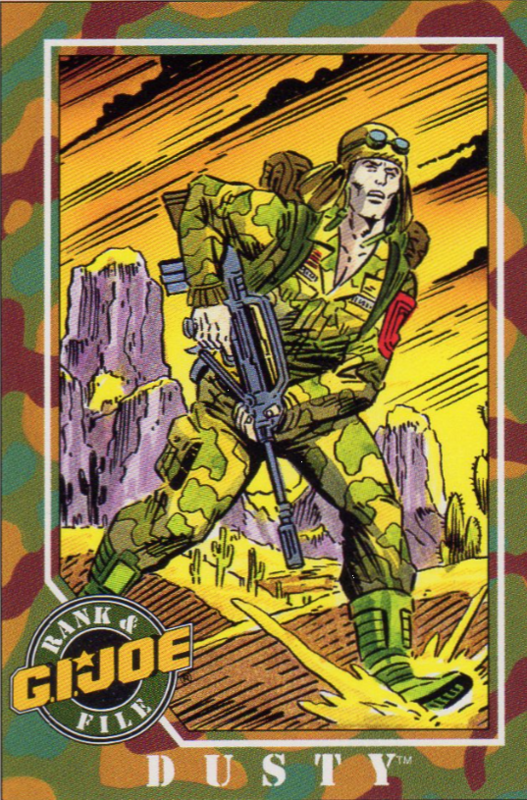 Oh and G.I.Joe desert mission specialist. Now that´s a different kind of cool. 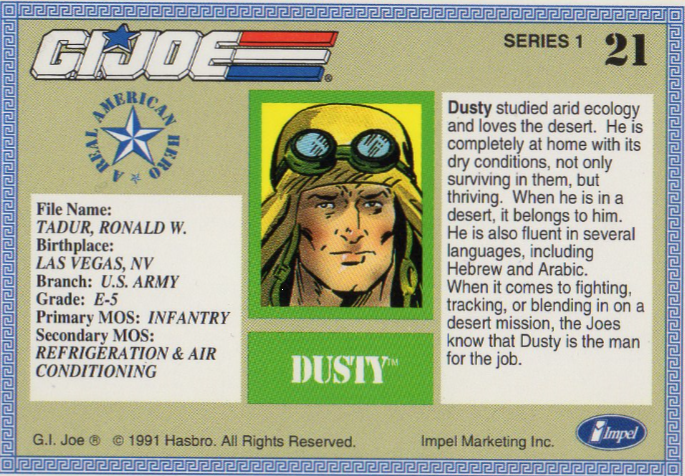 Going through the page dedicated to Dusty on the G.I.Joe wiki site, I read that he plays quite a prominent role in the Action Force Weekly Comic series. I always thought that these stories were 1 on 1 copies from the Marvel ARAH run (after the Baron stories). Seems that there were several stories made for the European market. As a European Collector, I have to admit I feel a bit stupid not realizing this sooner. On the other hand, it gives me another excuse to go shopping the web for Action Force Weekly Comics. Now here’s something I have been pondering over. We could really use a real life G.I.Joe team, be it all American or a joint force from all over the world. We can’t solve this by bombing civilians and opposing fractions in the name of counter-terrorism. We need to attack IS online to keep them from spreading their propaganda, cut off their finances, put a full embargo on weapons dealing in the region. In short, we need specialists doing their stuff and fixing this world. This is not a war between countries, this is a group of fanatics that use a ridiculously strict version of a faith to judge others. Religion is a human invention that the – so called – smarter people used to keep the ‘simple folks’ in check. I have no problem with people believing in Allah, God, Jawheh or the Flying Spaghetti Monster, but no one should be forced to believe what you believe. And religion should never be used to control a country or people. There are simple rules one should live by. All men are equal, women too, respect each other, don’t kill, … These should be abundantly clear to every human being that can think straight. I personally don’t feel I need a religion (in the present case some elitist power-hungry idiots) to help me see those values. If you do, take those values at heart and don’t be blind or deaf for the world around you. Religion can give people hope and strength, I won’t deny that, but they also try to put you in a box. You’re either with them or against them. We – as humanity – should be better than those stupid playground politics. I don’t know, maybe after all these years of evolution, mankind is still but a child. Maybe it’s just time for us to grow up and take responsibility. We only have one world and we all need to live on it. We should focus our efforts on making it the best for all of us. And now… back to Dusty. I think he’s a good guy. Not much more to say really. Until next time.